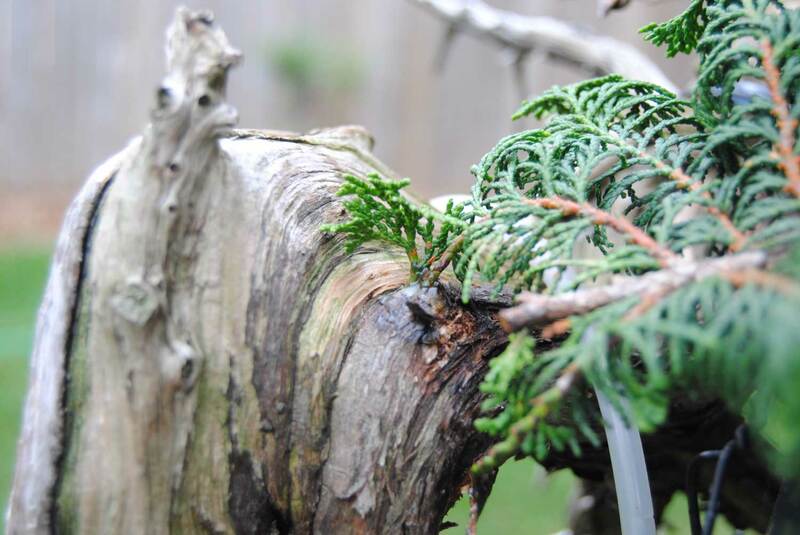 In Spring 2012, I tried bud grafting hinoki foliage on a scraggly collected Thuja, which failed. 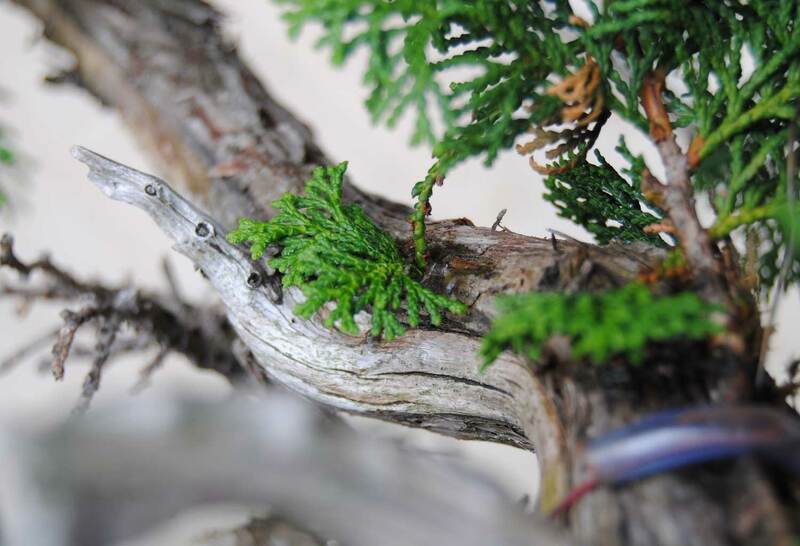 Later that year, I tried approach grafting hinoki foliage onto the same plant. Over one year later, the results are still unclear. 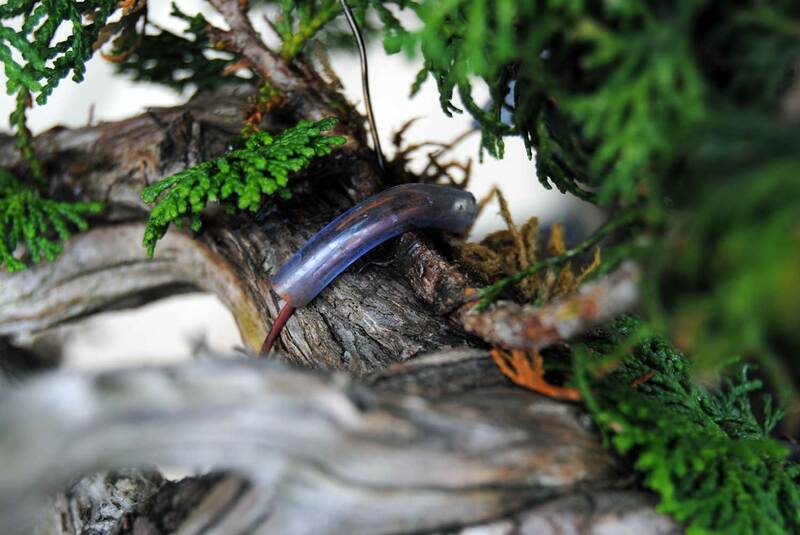 The approach graft is alive and well, but it has not clearly fused with the Thuja tissue. I have a feeling the wounds on scion/stock both just healed over instead of grafting with one another. At this point I would say the approach graft was not successful. Not convinced that this approach graft has taken. Nevertheless, I left the approach graft in place and moved on with my third attempt of grafting this plant with a third type of graft: the One-Point aka Single-Point Graft. A variant of [thread grafting] is the one point graft. Instead of passing a bald branch through a hole in the trunk, you fold over a branch and squeeze it into the hole. Before insertion, you scrape the outer edge of the fold with a thumb nail to remove the cambium. When jammed into the hole, the cambium layers of the drill-out and of the scraping will touch and merge quickly. This approach has several advantages. You can perform it at any time during the growing season as the branch does not need to be bald. This is especially useful in species that grow out but once in a season, such as pines. It also takes less time to complete. You do not have to drill all the way through the trunk, but only a centimeter or less. A few weeks ago in mid August I looked disgustingly at my still-ungrafted Thuja and grabbed my drill. Three one-point grafts were initiated and today they all still seem to be alive. 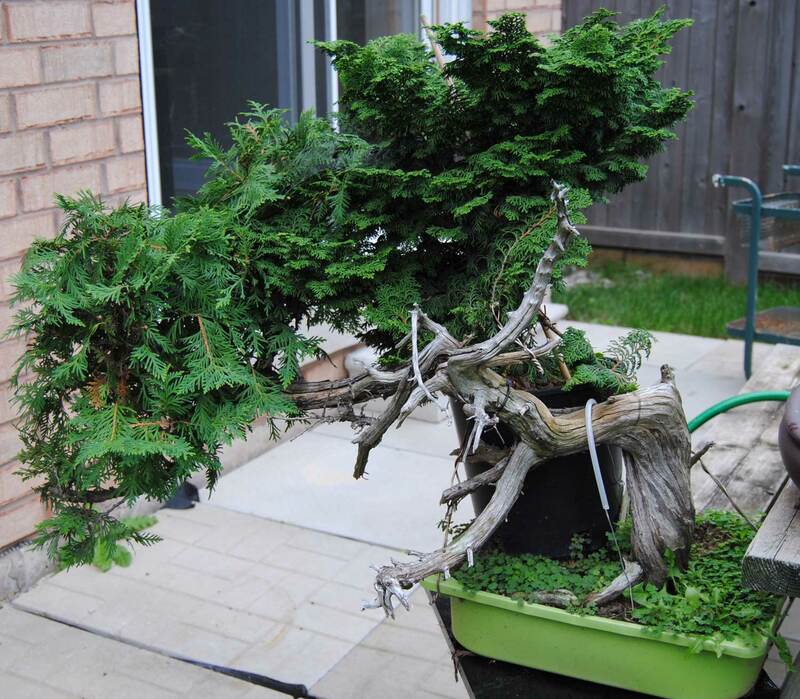 Basically what I have now are three thread grafts in my Thuja, and hopefully now it is just a waiting game. A one-point graft that seems to have survived the initial folding-and-cramming. The scion for this graft was growing off the scion used for last year’s approach graft. Another one closer to the base of the trunk. All of the one points were slathered with some Japanese wound sealant which is pretty much white glue. I’m not sure if this tree is even worth all the trouble. Sure, it will be nice if I can make it a bonsai, but this grafting project now seems more about me proving to myself that it can actually be done.